My family and I first went to Japan in 1984, when I commanded a guided missile destroyer newly homeported in Yokosuka. It didn’t take long before the beauty of Japan and the hospitality of the Japanese people captured my admiration and affection. Both of our children returned to Japan later for exchange visits. Although Japanese people and Americans are different in so many ways, through the years our people have formed unique personal bonds and a sincere appreciation for each other’s countries. That is especially true among service members, government civilians, and their families who have served in Japan. 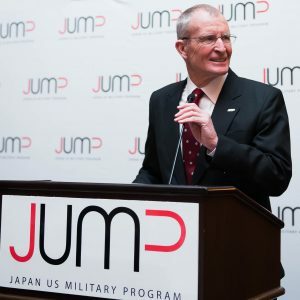 While I no longer explore the coast of Japan from a ship, I am now happy to be working with JUMP and helping to connect past and present service members and their families with others who have this shared experience. I believe Japan and America have much to offer each other, and JUMP is a powerful tool through which we can continue to build upon the U.S.-Japan alliance. Admiral Dennis C. Blair, USN (ret.) is a renowned expert on Asia Pacific policy and issues, having served as Director of National Intelligence and Commander in Chief of the U.S. Pacific Command. During his 34-year Navy career, Blair served on guided missile destroyers in both the Atlantic and Pacific fleets and commanded the Kitty Hawk Battle Group. Ashore, he served as Director of the Joint Staff and held budget and policy positions on the National Security Council and several major Navy staffs. He is the Chairman of the Board at Sasakawa USA, which administers JUMP, and he has participated as a recurring featured guest at JUMP events.